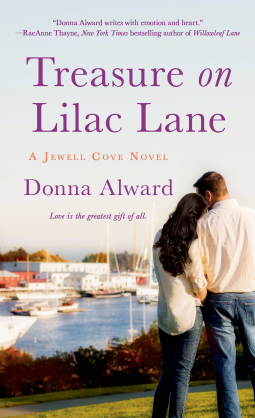 Rick Sullivan was Jewell Cove's golden boy when he left home to join the Marines, a star athlete and the reigning heartthrob. He came home from Afghanistan wounded in both body and soul. He's struggled with alcohol, anger--and the painful months of watching his mother die. There's no question Rick is damaged. Jess Collins has struggled with her own issues, including an abusive relationship that only her brother Josh knows the truth about. Now she's happy running her her art shop, Treasures, and only a little bit wistful about her siblings and her Arsenault cousins one by one finding lasting relationships. It's really inconvenient that Rick Sullivan, who now seems to represent everything she's learned to be wary of in a man, is at least as attractive to her as he was when they were in their late teens. Alward deals skillfully with the complexity of the emotional minefield that both draws these two together and keeps them apart. The slow emergence of Jess's secrets, Rick's secrets, and secrets from the past neither of them knows about add a depth and a richer texture to the growing relationship. The tight-knit Collins and Arsenault families weave a warmth into that texture that makes this even more satisfying.